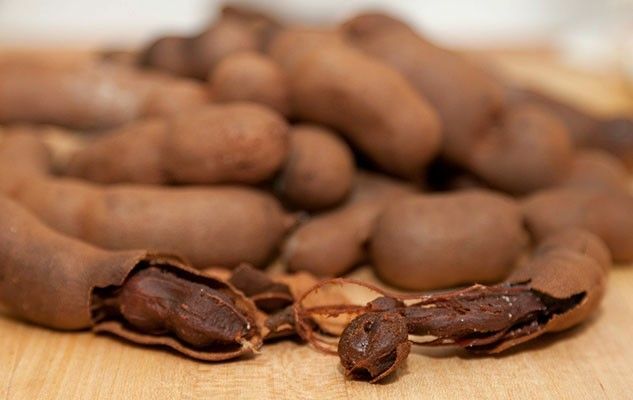 The fruit from the tamarind tree is consumed in practically all the cuisines of the tropical regions, where it is appreciated for its acidulous taste and its refreshing effect. It is also used as a laxative in medicine. The tamarind tree is as tall as a walnut tree, with a large trunk and dense canopy. Its fruits are made of brown-coloured pods that are shaped like French beans and they contain pulp and several seeds. It is this acidulated, fruity and refreshing pulp that is extracted and used in cooking. Tamarind gets its name from the Arabic tamar hind meaning ‘Indian date’, because the Arabs compared its pulp to that of dried dates. Tamarind is available in various forms in Asian grocery stores and markets. The most practical is the concentrated paste that can be mixed if need be with hot water and which stays fresh for a very long time in the refrigerator. Tamarind paste is used for making several curry dishes and is an essential ingredient for the traditional Pad Thai. In some countries, this fruit is used for making lemonade and sweets. Originally published in the Journal de Montréal on June 4, 2011.